Later this summer, I’m opening registration for my FEAR & WRITING course. It will take only 30 minutes a day, over the course of seven eight days, to complete. My goal is to make it so fun and simple, you will look forward to writing every day. In February 2016, after working in 35 jobs, I chucked it all to become a full-time writer. Did I write eight hours a day? Did I write four hours a day? Did I write even just one hour a day? I had finally achieved my dream of being a full-time writer, and I. COULD. NOT. WRITE. Do you know how crazy that made me feel? How angry? How ashamed? How sad? I couldn’t figure it out. I’d been writing on the side for 12 years, all while holding down jobs and running my own business. Why couldn’t I do it now, when I had all the time in the world? Now that my writing was no longer a hobby, I was paralyzed by fear. My writing had to be good. It had to make money. It had to be my career. Those were the thoughts swirling around in my head. Even when I wasn’t thinking about it, those feelings were there. It kept me scared and it kept me feeling small. Many days, I couldn’t write at all and would spend the evening watching Netflix and hating myself. My husband Marcus tried encouraging me, and it helped me loathe myself a little bit less, but it didn’t help me to write. Somehow, as the year went on, I managed to write the first draft of my suspense novel. It was a slow and painful process, and by October 2016, I was spent. I was tired of having to make myself write and disappointed that it had taken me nine months to finish one draft instead of the three months I thought it would take. (I realize now that nine months isn’t very long, but since it had taken me only four months to write both the first and second drafts of my first novel, and I did this while I was working at a job, I had unrealistic expectations.) I was beat, and took the rest of the year off from writing to recover and rejuvenate. When 2017 began, I was hopeful that my second year of full-time writing would go better. But then death hit. And then it hit again. And again. And again. And again. In 2017, Marcus and I knew of 13 people who died, including Marcus’s father whom I loved and knew as Mr. Mark. Many of our good friends also lost a parent. Overall, 2017 was a year of funerals, crying, eating my feels, gaining weight, and grieving. But despite all the death and sadness, about half way through the year, things changed. I had made writing into a habit. With the help of my therapist, I had developed a simple technique that helped me consistently write 5-6 days a week. It felt like a small miracle. Right around that time, Linda Johns, librarian at the Seattle Public Library’s downtown Central Library, asked me if I wanted to teach a workshop for the library’s Seattle Writes Program that fall. Heck yeah, did I ever! Seattle Writes hosts a slew of writing workshops taught by local authors at various branches of the Seattle Public Library. I had been going to Seattle Writes workshops for the past few years and found them to be encouraging and helpful. They were also perfect for my budget…as in, they were free. I was excited to teach for Seattle Writes and give back to a program that had given me hope and encouragement. 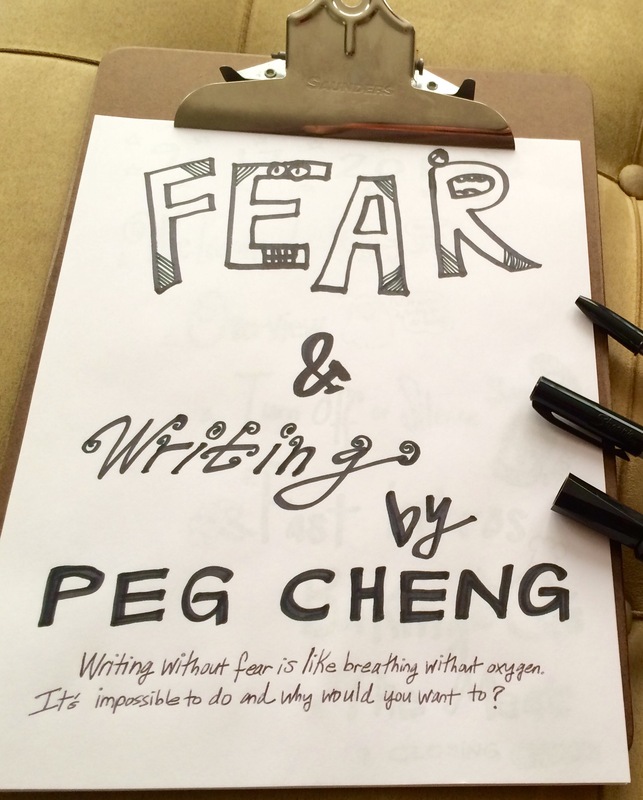 I knew immediately what I wanted to teach–a workshop on FEAR & WRITING. I tried to create the kind of writing workshop that I would have wanted to attend when I was in the depths of fear, shame, and self-loathing. I was going to teach the things that had helped me turn writing into a habit: starting small, frequency over quantity, freewriting, and more. I spent the summer getting it ready, but when fall rolled around, I was afraid that people wouldn’t show up. My workshop was on a Sunday afternoon. It was raining. And the Seahawks were playing. While driving to the Greenwood Library with Marcus, I sent a prayer to the universe that 15 people would show up. More wanted to come in, but we had reached capacity, and the resident librarian had to lock the door to the room and turn people away. I found out later from Linda that my workshop was the biggest one in Seattle Writes’ history. Crazy! Six months later, I taught FEAR & WRITING for the Seattle Public Library again. It went well and I got more ideas on how to improve it. I also continued to write on a near-daily basis and started cranking out my novel drafts much faster than before. The next month, in April 2018, I finished my suspense novel and turned it in to my editor. It had taken me 11 years of planning and 26 months of writing to finish this novel. It was one of the hardest things I’ve ever done. It’s true what they say about writing being a marathon. Finishing my novel gave me a feeling of relief and triumph that marathoners must feel when they cross the finish line. I was happy for a few minutes and then I literally couldn’t move for the rest of the day. I was exhausted. I took that day and the next six weeks off to relax, clean, garden, meet up with friends, and live life without thinking about writing or feeling like I had to write. It felt good. Really good. It was after this break that I finally felt ready to create a FEAR & WRITING course. I’ve wanted to create this online course ever since I taught the first FEAR & WRITING workshop on that fateful, rainy Sunday in September, and realized that there were a lot of people besides me who were dealing with fear and writing, and that many would not be able to make it to one of my live workshops. That day, I realized that I wasn’t alone. Face your fear of writing and become the writer you’ve always wanted to be.